One of the many reasons I do this podcast is to show you that work doesn’t have to be miserable, you can actually make work fun. 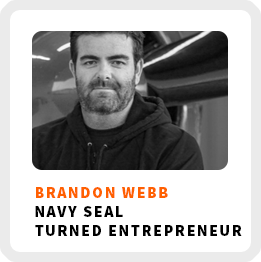 Brandon Webb made making his work fun the guiding principle of his career. He’s the founder and CEO of Hurricane Group, a network of content brands and products for military and outdoor enthusiasts. Currently, his company is generating an annual revenue of over 8-figures! He had an incredible journey on his way to making that kind of revenue, he left the Navy Seals at the height of his military career in 2006, lost all his money in his first startup and had what he called a good divorce. Why Bandon decided to shift away from advertising as the primary revenue stream of his business, selling his own products instead. What he learned about choosing business partners after his first business failed. How he uses positive psychology to rebuild his life. Why embracing fear creates growth. Core work activities + habits: 1) Running his weekly team video conference and course correcting. 2) Looking at his financials daily. 3) Creating content across the brand. Ideal work environment: Usually in a quiet area or with friends having conversations. Reading magazines or books and getting new ideas. Definition of success: Giving employees a fun job with both purpose and freedom. Self-reflection practice: Taking time every week to reflect and do self-nourishing activities like having lunch with a friend. 90-day goal: Sell 4 million dollars in gross revenue. 1) Talking to yourself or writing down your goals. 2) Change the way you talk to yourself internally.